This page references an outdated lens calibration process. Please check with your Lightcraft representative for the latest process. 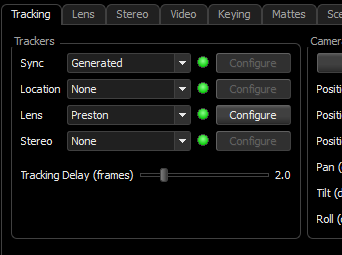 Before we can start, there are a few settings that should be enabled in Previzion. Check that near focus shows a close-to-zero focus lens fraction and infinity focus reflects a number close to 1.000. Do the same for zoom, when necessary, where all the way wide is a near zero focal length fraction and all the way long is a number close to 1.000. To enable this, go to “System Tab” and check “Show Lens Fraction”. Use your FI+Z controller to verify that the motors reflect the correct values. 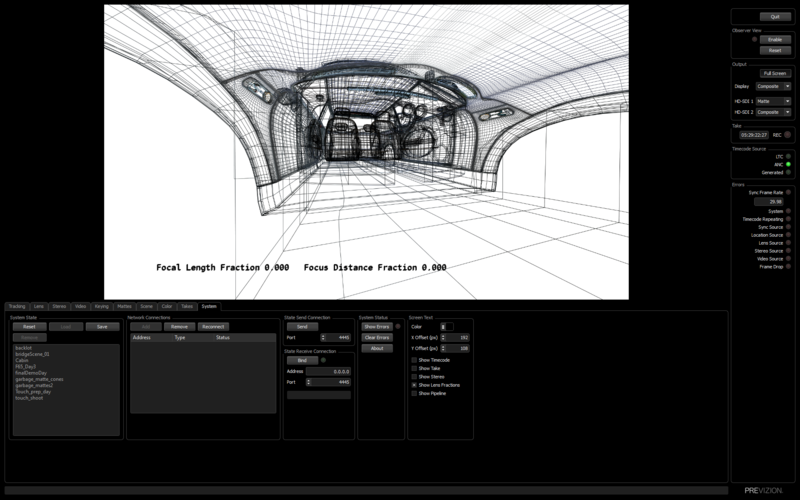 If the values are inverted, there are settings in Previzion that flip this value. 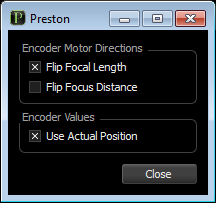 Under Tracking Tab, click “Configure” next to “Lens” and check the motor value to be flipped. Some lens controllers like CMotion or FI+Z 3 MRD have a physical switch that flips the motor’s orientation. In addition, the correct sensor width (in mm) must be used. Most common cameras are well documented and Previzion has them in the default settings. When a manufacturer specify the sensor size to be 2/3″, super-35, etc., often times that does correlate to the actual sensor size, per se. The nominal 2/3″ (1/2″, Four Third) actually refers to the corresponding vaccum tube size that would have been used to produce the image circle that corresponds to the image circle of the camera sensor. 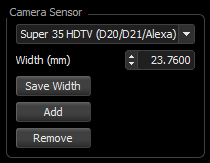 For cinema cameras that specify Super-35 sensor size, that, again, doesn’t actually mean the size of vertical cinema 35mm film strips, but it is very close to it. Some manufacturers measure it differently from the next. Sony’s F65, for instance, is really close to the nominal 25mm of Super-35, at 24.7mm, but at a 17:9 aspect ratio. So, not necessarily the same as 3-perf size of negative super-35, but nominally close. 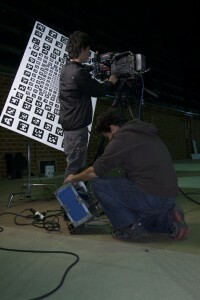 On RED Cameras, it depends on what resolution and the firmware your RED Camera is running. Firstly, resolution changes on RED ONE MX didn’t change the interpolated resolution being recorded. Instead, the RED ONE MX cropped the sensor to the corresponding pixel count. 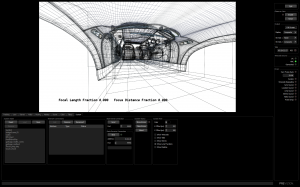 This changes the effective “sensor width” in Previzion. Secondly, on some RED ONE firmwares, there used to not be any 4.5K resolution. There used to be up to 4K resolutions, but the camera operator had a small look-around for framing purposes. For cameras not listed, you can always add your own. You will be prompted to load a Marker file that correspond to the Marker Board being used. Click Load to load the correct marker file. Use LensCalibrationCoords_163-4×24.cal, if you have the oscillating 14-foot board with detachable “wings”. Use Markers303targets.cal, if you have the spinning calibration board. 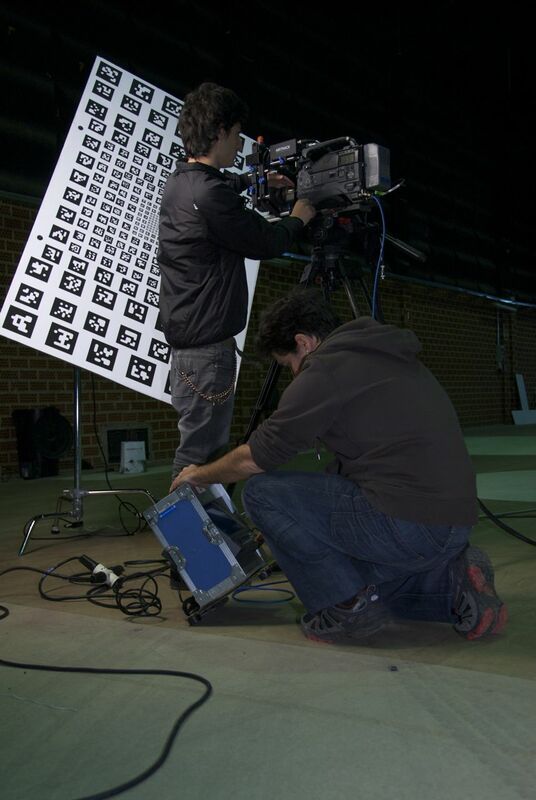 Currently, all Lightcraft Lens Calibration Systems ship with the 14-foot marker board with detachable wings. But we still support the spinning board as a legacy system. Once all these settings are checked and re-checked, press “Calibrate”. 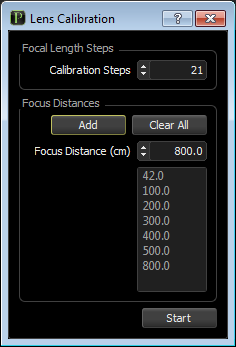 Next, pick the number of calibration steps and the various distances to calibrate at. 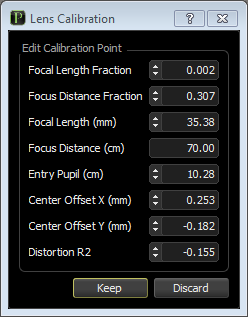 The Focal Length Calibration Steps correspond to the number of steps Previzion will sample from throughout the zoom range of a zoom lens. The recommended value is 21 steps. For Prime Lenses, the number of steps should be set to 1 step. The Focus Distances correspond to the various distances that you are able to calibrate at. 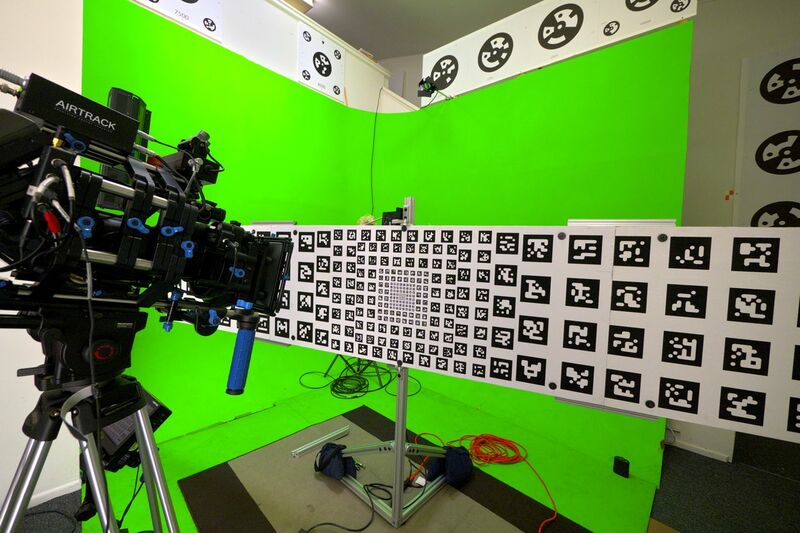 These distances are measured from the very center of the oscillating marker board to the camera’s sensor plane. To add a new distance type in the value in centimeters and press Add. To remove a point or change a value, you will need to Clear All. At the minimum focus of the lens, make sure that the board can still move its whole range at that distance without hitting anything. 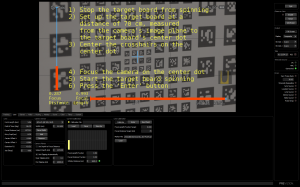 A good way to go about this is to keep the board static and move the camera as close as possible till it either hits its minimum focus distance or it starts hitting the board. Depending on how a given lens’s focus travel is setup, you may need to add more distances. Also, depending on the limitations of the location where the calibration is being done, there just may not be enough room for the 8m distance. The calibration cycle is quite simple, but it is time consuming and repetitive. Diligence is required and it helps to have a notebook that you write down notes from one calibration step to the next. Adjust the camera at a new distance and focus camera accordingly. Adjust zoom as indicated and tell Previzion to calculate lens values. On prime lenses, this is a single step. 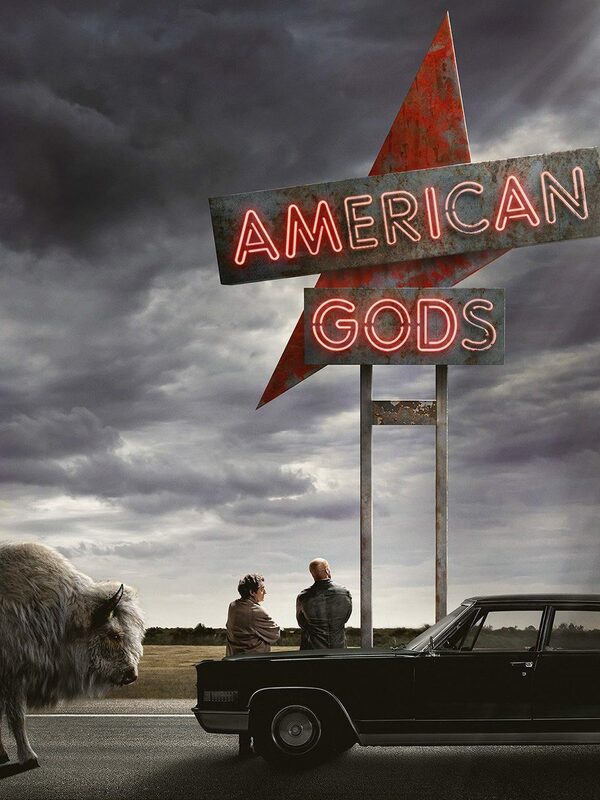 On zoom lenses, this repeats 21 times. Make sure the board is not oscillating/spinning. Set the camera at the indicated distance always making sure to measure from the sensor plane to the very center of the board. Center the cross-hair on the very center of the board. 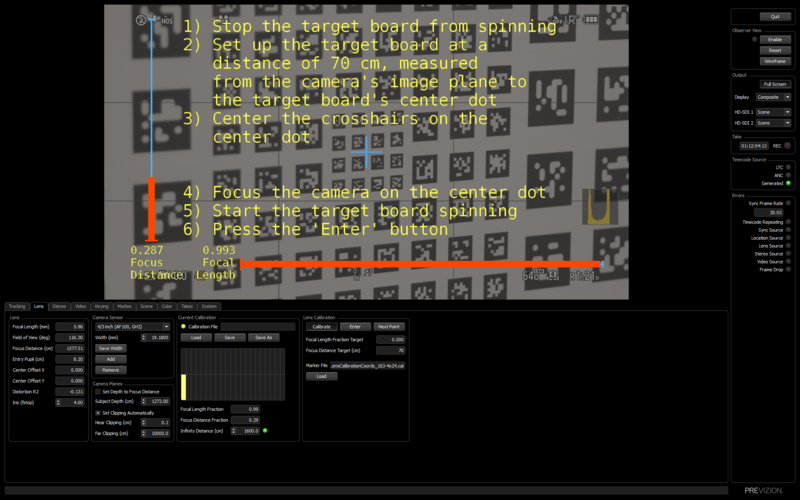 As previously mentioned, the camera need not be Center the cross-hair on the very center of the board. 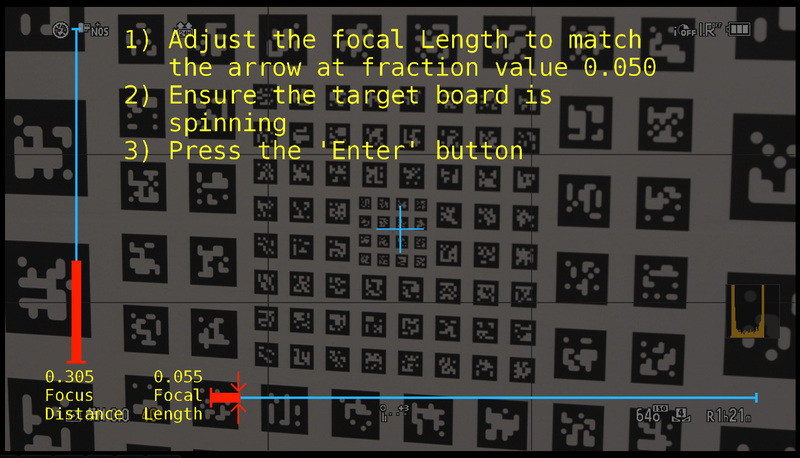 The Marker Board has a tiny dot that marks the center of the optical pattern. You may zoom in to center and then zoom back out. Focus the camera on the board. This is where you may open up your f-stops all the way to help you focus. Just make sure to stop back down to the proper f-stop. 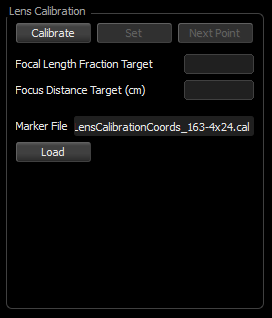 From this point until the next calibration distance, focus should not change. Cautiously start the board oscillation/spinning but keep your foot on the foot switch and verify that the entire motion of the board does not hit anything. 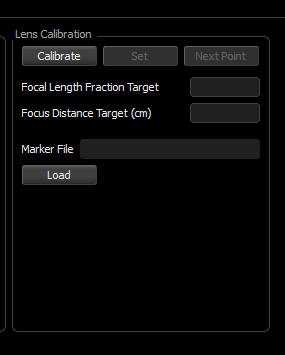 Previzion will now capture several still images, identify the marker patterns and calculate the lens values. 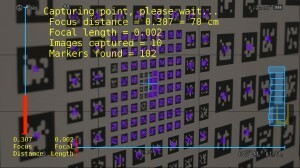 DO NOT change focus or zoom at this point until Previzion has completed the calculations. You will notice that the center of each optical pattern that gets identified has a purple X and a square. 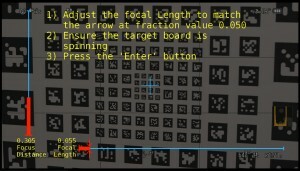 The text on the screen outputs the values for each point being captured. To the right of that screen, you will notice blue rectangles being stacked on top of each other. 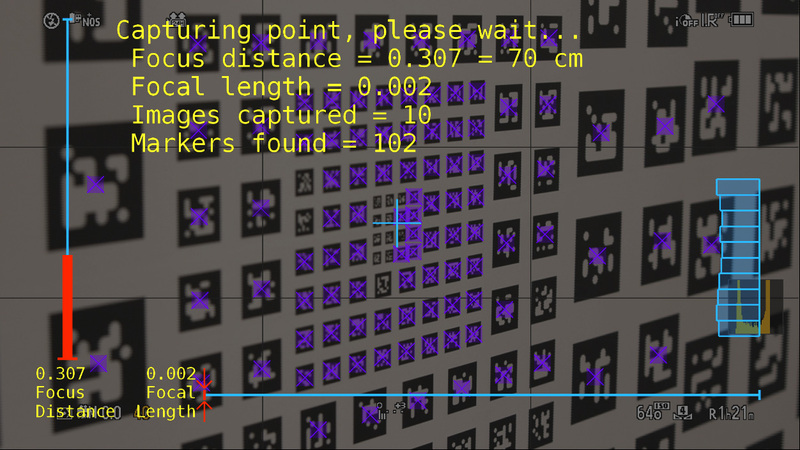 This is a graphical representation of the number of Marker patterns being found. This changes according to the field of view of the lens as well as the position of the oscillating/spinning board. Focal Length – This number should be about the same as the one written on the side of the lens. It can diverge considerably at higher zoom levels. Entry Pupil – This reflects the virtual convergence point of the lens or “forward nodal point.” This distance is from where it calculates this convergence point to the sensor plane. Write down this number and keep track of it to see if it is trending upward or downward. For a zoom lens, it will typically begin near the front element of the lens and progress backwards as the focal length of the lens is increased, typically becoming negative at some point. Distortion R2 – Measures the amount of radial lens distortion. It will typically be a small negative number (about -0.1) for wide angle lenses, and rise to be a small positive number (about 0.2) as the focal length increases. Significant variations can be seen toward the end of the zoom range. This too should be written down to see if it trends upward or downward. As long as these values are close to expected, press Keep and you will be prompted to zoom in until the blue arrows turn orange, like before. If any of these values are too large or too different from expected, press Discard and redo this step. Focal Length Fraction – Shows the value coming from the lens controller for focal length in a value from 0.000 to 1.000. Focus Distance Fraction – Shows the value coming from the lens controller for focus in a value from 0.000 to 1.000. Focus Distance (cm) – Displays the current calibration distance. Center Offset X (mm) – Shows the calculated lateral distance from the center of the sensor to that of the optical axis. Lenses are not perfectly centered, and zoom lenses may move around as they go from wide to tight. Center Offset Y (mm) – Shows the calculated vertical distance from the center of the sensor to that of the optical axis.